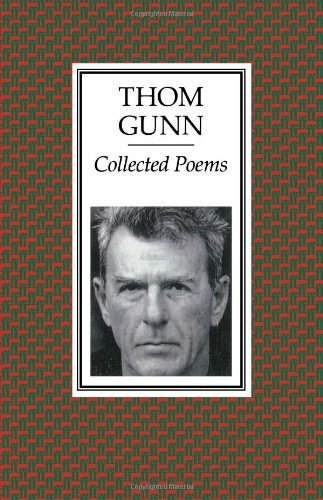 Thom Gunn (1929-2004) is a poet whose work thrives on contrast and contradiction: English tradition and American idiom; strict form and free verse; intellectual discipline and physical hedonism are all held in balance in his risk-taking poetry. Gunn was born in Gravesend, Kent, to a journalist father and a mother who encouraged an early love of books. His autobiographical essay 'My Life Up to Now' (1977) recalls his early childhood warmly, but this sense of security was cut short, first by his parents' divorce when Gunn was eleven and then by his mother's suicide four years' later. After two years National Service, Gunn went to Cambridge University where he was influenced by the critic F. R. Leavis's emphasis on the expressive significance of verse rhythm and by a reading of Donne and Shakespeare which informed his early style. His mastery of metaphysical conceit, as evidenced in his first collection, Fighting Terms (1954) attracted considerable praise, his poems' combination of formality and modernity allying him in critics' minds with 'The Movement' poets, loosely centred on Larkin. Gunn was never so fiercely anti-modernist however, and this early label soon fell away, particularly after his move to America. This was prompted by his relationship with an American student whom Gunn had met at university, Mike Kitay, with whom he formed a lifelong bond. The couple settled in San Francisco, a heady place to be in the 1960s for a young, homosexual poet, and Gunn embraced the freedoms of his new lifestyle with enthusiasm, exploring the counter-culture and experimenting with hallucinogenic drugs. The shift can be seen in his poetry: 1959's The Sense of MovementM celebrated contemporary culture with poems in praise of bikers and Elvis Presley, but did so using traditional metres. By Touch, ten years' later, Gunn had become much more at home with free verse, his tone more expansive. However, too much can be made of this dichotomy: Gunn himself averred that "my life insists on continuities - between America and England, between free verse and metre, between vision and everyday consciousness." This productive period was brought to an end by the Aids epidemic of the 1980s in which Gunn lost many close friends. The darkness of this time is reflected in The Man with Night Sweats (1992) which won the inaugural Forward Prize for best collection. His final book, Boss Cupid (2000) showed Gunn on typically wide-ranging form, encompassing a controversial sequence written from the point of view of the notorious serial killer, Geoffrey Dahmer, and moving meditations on survival. Gunn's Archive poems come from a significant period in his poetic development. 'Considering the Snail' is from his third collection, My Sad Captains, and is written in syllabics, that is each line contains the same number of syllables. Gunn later credited his experiments in this form with opening up his style. In this masterful description the strange line breaks enforced by the syllabic structure re-create the snail's effortful movement, a quality Gunn's gently hesitant reading brings out. 'Moly' from the collection of the same title can be read as a veiled description of a drug-induced trip. Gunn's use of couplets, combined with pounding speech rhythms, gives the poem a sense of claustrophobic panic as the speaker begins to realise what kind of body he's trapped inside. It is entirely in keeping with Gunn's achievement that he explores the physical and psychological effects of LSD through the medium of classical myth. Touch, risk, trust, improvisation - "the intellect as powerhouse of love." The life and work of a true servant of eros.